This is similar to regular pasta/pizza sauce but here roasted nuts is been added. This sauce can be used as a tomato base on a pizza or pasta. In this sauce tomato puree is been simmered to thick consistency with dried Italian herbs, mint and spiced with paprika. Roasted chopped nuts is been added and it can also be blended to powder before adding it to the sauce. 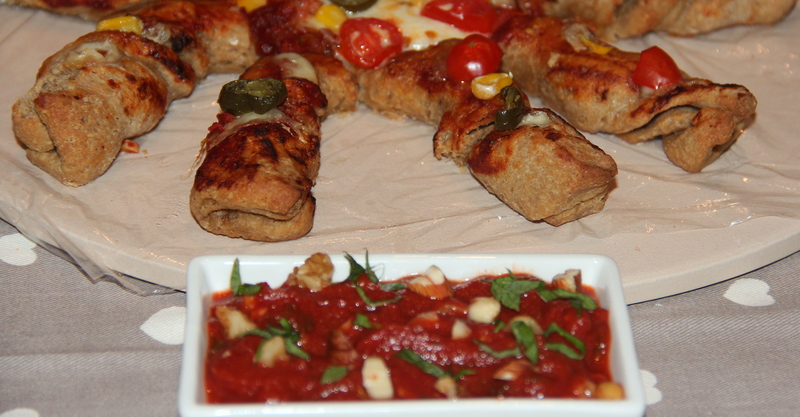 I served this with Oats and Whole wheat flower pizza (Check for recipe by clicking here). In a small sauce pan heat olive oil add in onions, as the onion becomes translucent and softens a bit. Add in tomato puree, paprika, honey stir over medium heat for 10-12 minutes or until thick. Add the salt, blend with a stick blender. Stir in oregano, roasted chopped nuts. Cool sauce completely. Use it on pizza base. Cheese can be included if desired. Posted on October 27, 2014, in Dips, Dips, Indian, International. Bookmark the permalink. 19 Comments. Always my pleasure. Have a good week. Looks absolutely delicious, Chitra ! When kept in the frig in a sealed jar, how long would it last, do you think ? What a couple of very interesting adds to this sauce. I never would have thought to add nuts nor mint. I bet it is delicious. Looks Good ! I want some ! I should try it. Sounds good!